The All Western Evergreen Nursery and Christmas Tree Farm offers pre-cut and cut-your-own trees native to the western United States. From Springwater: Go west from the Springwater light on Rt 15 North. Just past the top of the hill, turn left on Co Rd 38 (Liberty Pole Rd). The farm is on the left 1.1 miles from Rt 15 at 6840 Liberty Pole Rd. From Geneseo: Go south on NY 63. About 6.4 miles after passing Rt 408, turn left on County Road 1 at Groveland. This road becomes CR 1A at Scottsburg (rt 256) and then Liberty Pole Rd (CR 38). 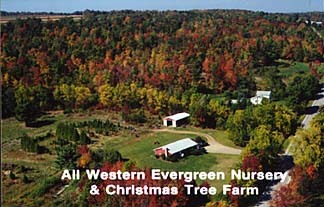 It is 7.1 miles from Groveland to the All Western Evergreen Tree Farm. From Honeoye: Take 20A west to Hemlock and 15A south to Springwater. Then follow the Springwater directions. From Rochester: Take I390 south to Exit 9 (NY 15 / Lakeville). Turn left onto NY 15 and follow Rt 15 through Lakeville and Livonia (16.5 miles). Just past Webster’s Crossing stay straight on CR 60 when Rt 15 bears left. Take the first right off CR 60 onto Liberty Pole Rd (CR 38). The farm is on the left at 6840 Liberty Pole Rd.